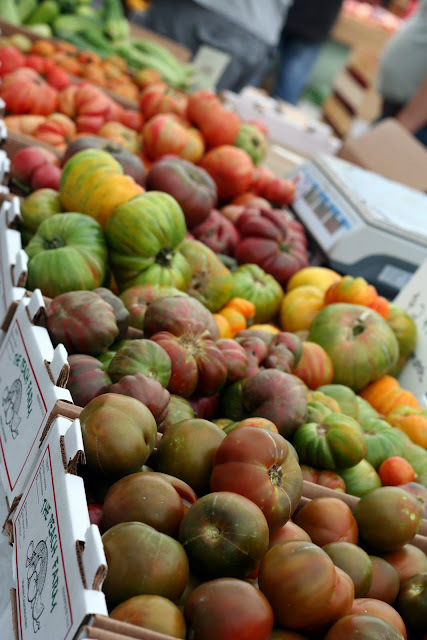 The big Downtown Farmer&apos;s Market in Salt Lake starts this Saturday, June 11th! Strolling through the market is a favorite ongoing event for many locals during the summer months in Salt Lake. Fresh produce, beautiful flowers, free tastings, and lots of animated dogs leading their owners around the market. Some &apos;musts&apos; at the Downtown Farmer&apos;s Market include the sun dried cherries, the honey butter from Knight Family Honey, the fresh pasta from Nu Nooz (get their early for this one), and all of the seasonal produce. For a list of what&apos;s in season right now and may be at the market this Saturday, there is a post here on Seasonal Produce in Utah. The Downtown Farmers Market runs Saturdays from 8:00am-1:00pm at Pioneer Park through Oct. 22. There are several other farmers markets popping up around the valley to also get excited about. Wasatch Front Farmers Market is located at Wheeler Farm in Murray every Sunday from 8am to 1pm. This market runs from June 12 to September 16th. Wasatch Front Farmers Market is also hosting a market at HeeHaw Farms in Pleasant Grove on Fridays starting July 8th from 3-7pm. Other neighborhoods around the valley have some pretty decent markets for fresh produce. The Sugar House Farmers Market opens July 8th and was pretty minimal last year but a good spot to grab fresh produce on the go. The 9th and 9th Farmer&apos;s Market was even less than minimal last year but a fun excuse to walk around the neighborhood. Maybe they&apos;ll be better this year. And there&apos;s the South Jordan Market, which is also quite nice. Caputo&apos;s Market also has a really great Locavore Market but their summer hours have yet to be announced. Outside of Salt Lake, there is also the Ogden Farmer&apos;s Market which is open July 9th through September 24th and the Provo Farmer&apos;s Market, which opened June 4th and closes October 29th. Read more from Becky Rosenthal at http://www.thevintagemixer.com/.